The popular German Christmas market returns to Leeds next week in style with a bigger than ever festive offering. Now in its 11th year, the Christkindelmarkt opens on Millennium Square on Friday 9 November with a scenic winter village made up of more than 40 traditional wooden chalet stalls from Germany offering Christmas gifts, food and entertainment. Organised by Leeds City Council in partnership with Frankfurt City Council and supported by media partners Real Radio and the Yorkshire Evening Post , over 250,000 visitors are expected to enjoy the festive atmosphere and sample a large variety of traditional German delicacies such as gluhwein, bratwurst sausages, schnitzels, soups and goulash, stollen, gingerbread, roasted nuts and candied fruits. All media are invited to attend the official opening of this year's Christkindelmarkt on Millennium Square at 3pm on Friday 9 November led by Lord Mayor of Leeds Cllr Ann Castle. Open daily until Sunday 16 December, the Christkindelmarkt also offers a unique festive shopping experience with something for everyone including handcrafted seasonal gift ideas, toys, jewellery, Christmas cards and unique festive decorations plus the traditional carousel ride. The market has been expanded for 2012, with new stalls including the Alp Chalet, a Bavarian mountain-themed eatery which offers a specialist food menu as well as a new outdoor bandstand which will showcase themed entertainment and a series of craft and skills workshops. Another new stall run by Leeds City Council's parks and countryside service will offer visitors the opportunity to buy winter plants, bird food and planters as well as a range of seasonal items. Anyone keen to get a memento of their visit to the market will also be able to purchase photos from official event photographers who will be on hand. The market will be open daily from 10.30am to 9:30pm Monday to Saturday and 10.30am to 7:30pm on Sundays with selected licensed and food stalls open late until 10:30pm. Due to arrangements for Remembrance Sunday on 11 November, the market will not open on that day until 12 noon. 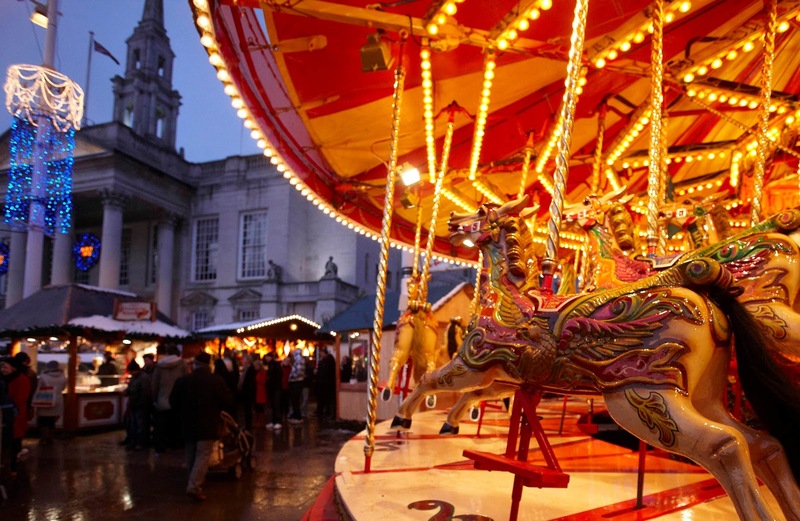 Also revamped and expanded for this year is the fairground element of the event, which will now be found in a new dedicated location on Cookridge Street running every Friday, Saturday and Sunday from Friday 23 November. Open from 11am to 9pm on Fridays and Saturdays and 11am to 6pm on Sundays, the fairground and will feature the popular dodgems, flying chairs, children's funhouse, convoy and cups and saucers rides together with a traditional candy floss and refreshment stall and outdoor cafe seating area provided by the adjacent Radisson Hotel. “The Christkindelmarkt is a fantastic event and attraction for Leeds which is enjoyed by thousands of people from the city and far beyond. For more information, call Leeds City Council’s Events team on 0113 395 0891 or visit www.leeds.gov.uk/christmasmarket. For further information of what is on and an essential guide on where to travel, shop, play and stay in Leeds during the festive season, visit www.festiveleeds.com.